I've introduced a variety of curating tools to classes and individual students this year. While this is an exciting way for learners to discover how to manage their information worlds, not everyone actually needs or wants to curate every single time they begin research. Students and teachers can exploit the curation efforts already out there. In fact, the new curation tools present an exciting new genre of search tool--tools for scanning the real-time environment, as well as opportunities for evaluating quality and relevance in emerging information landscapes. 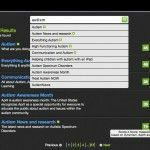 Because a couple of my seniors selected autism as an area of interest for their senior project, I'll use this topic as a sample search in six of my favorite new search tools. Scoop.it is one of the most popular and fastest growing tools for curating an online magazine. The little green box listing Scoop.it Score functions as a metric for measuring topic quality based on dynamism, depth, and audience engagement. Browse through Scoop.its by scanning those listed with Top Scoop.it Scores, Trending, Featured, and Popular. Or search without registration (by clicking on Browse more Awesome Topics on the bottom right of the homepage), Registered users (who first click on Get an Invite) can search via the Explore Tab and follow those Scoops they are most interested in, and suggest content to other curators. Students may subscribe to the RSS feed for any useful Scoop.it. Librarians all over the globe create LibGuides for their communities. But even if you are not a LibGuides user or creator, you can benefit from the community's shared resources. I can't create a guide for each student's research interest, but it seems that wonderfully knowledgeable librarian out there usually has. Thank you, friends! Students can search the entire Community or limit their search by type of library. Once they have selected a Guide, they can search for specific content within the Guide itself. Results display with tags and date of last update. And they are generally curated by library specialists. Note: some of the Guides' resources may be subscription content available exclusively to the creating institution, much of the content we've found is also web-based and free. Students may bookmark Guides or subscribe for RSS alert updates. Paper.li is probably the easiest strategy for creating a media-rich newspaper of tweets and feeds and hashtags. It is also beautifully searchable. Results display the name of the editor and number of views. Both may be used as preliminary clues toward evaluating reliability. Students may subscribe to email alerts for or embed selected papers. I wrote about the new Delicious Stacks feature earlier this week. Though it is still a newborn curation tool, its archive is already surprisingly rich. Results are listed with tags, and numbers of links and views. With a Delicious account, students may share or follow Stacks. Pearltrees offers another community for visually sharing resources built on creating networks (or trees) of interlinked pearls. And finally, it is very possible that some kind curator has created a Livebinder for many of my students' research interests. Though not really a real-time curation tool, these virtual three-ring binders gather and organize websites, documents, narrative, media and more. Livebinders' search results display with a five-star user rating system and number of views. Once a useful binder is discovered, students can embed it nearly anywhere. Students with LiveBinders accounts may add binders to their shelves.